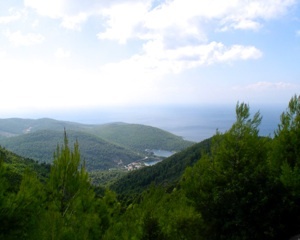 Aleppo pine forest dominates the centre of Skopelos from the summit of Delphi, down the steep slopes to the very edge of the sea, even clinging on to the coastal cliffs of Hovolo beach and there are significant stands on the Palouki Massif and the Glossa peninsula. It is ideally suited to hot, dry climates and grows on a variety of soils favouring areas over dolomite rock. 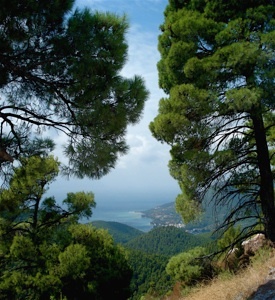 The pine forest has a high aesthetic value, confirmed by taking a stroll along the tracks on Mount Delphi, where cool shade, the rustle of the wind in the trees and the fresh smell of resin create a welcome contrast to the busy heat of the summer beaches. The forest is not simply a collection of trees but is a complex biological system. 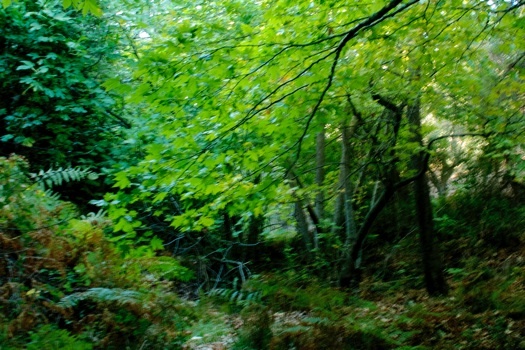 In some parts of the forest, the trees are so close and densely packed that little light reaches the ground and underlying vegetation is sparse, this type of forest is considered to be rare1, but in most areas it is multi- layered with a rich undergrowth of shrubs, consisting of species found elsewhere in the macchie or phrygana. The assortment of shrubs varies from place to place depending on the soil type and other local factors; there are climbers with ivy, and prickly smilax and scattered herbaceous plants, and grasses. On the edge of the forest and in small clearings, where more light can penetrate; the smoke tree (Cotinus coggygria), wild rose, honeysuckle and a variety of wildflowers emerge. 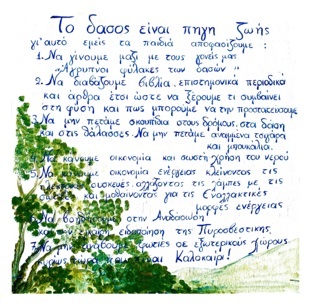 Not only has the Biopolitical International Organisation (BIO), given Skopelos the accolade of Green and Blue Island but the inhabitants of Skopelos and their children have recognised the importance of the forest as The Source of Life and pledged to support it as a valuable resource. 1. Along with our parents to be guardians of the forest. 2. To read books, scientific publications and articles, in order to keep up to date. 3. To never throw rubbish onto the roads, into the forest or into the sea. Not to throw away cigarette ends or bottles. 4. To make economical and proper use of water. 5. To make economical use of energy, switching off electrical devices, changing to the correct bulbs and learning about alternative forms of energy. 6. To facilitate reforestation and make timely and clear alerts to the Fire Brigade. 7. Not to light fires in the countryside especially in summer. 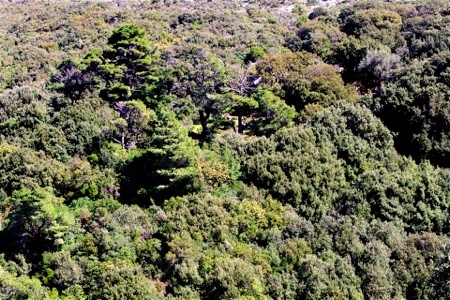 Although the idea that the whole of Greece was once covered in luxuriant forest is probably a myth, the original vegetation of Skopelos was probably Mediterranean oak forest.2 Aleppo pine is a pioneer tree; it can create a nursery environment which help in the establishment of other trees including oaks. 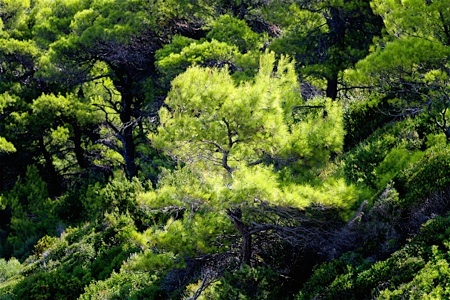 Aleppo pine forest may not be the climax vegetation of Skopelos. but it may be an that it is important step towards re-establishing this state; a process likely to take many decades and will only be completed if the area is protected. and forest, it supports a large variety of species some of which are survivors of the ancient woodlands. It is, at its simple level, a collection of evergreen shrubs, over 1.5metres tall, with specific, key species; evergreen oaks, arbutus, juniper and tree heather but including many others. The bushes usually form a dense mass of intertwining branches and let in little light, so a herbaceous undergrowth is lacking. 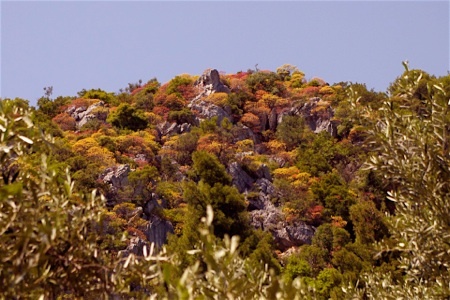 A large area of macchie occurs on the Palouki Massif; this is not simply a confluent expanse of shrubs but varies from a low, prickly macchie, mainly of kernes oak, to tall arborescent macchie of holm oak, with an olive-carob formation (Oleo-ceratonion Macchie) 2. In some areas groups of holm oaks have reached the size and status of forest. 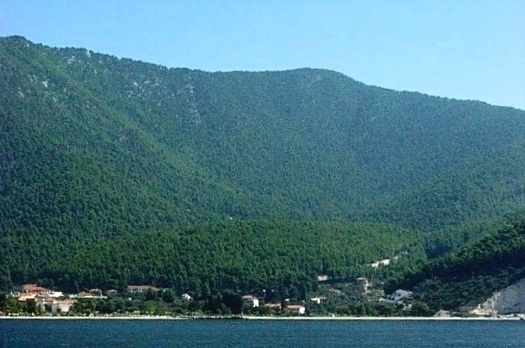 The South Eastern area centred on the Palouki Massif, has cultural as well as botanical importance with a number of centuries old Byzantine Monasteries. During most of the year the macchie appears as a drab, dark green mass but in spring it becomes a mosaic of pale greens, subtle pinks and yellows, as new growth, flowers and catkins develop. 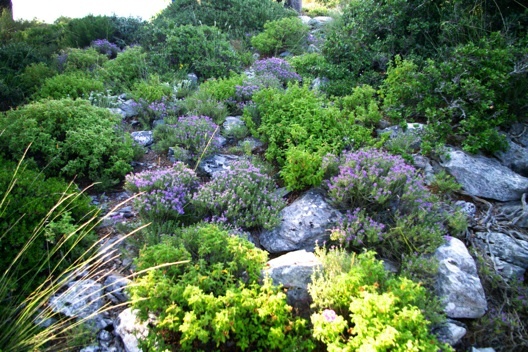 hemispherical bushes, sometimes referred to as the hedgehog heath. 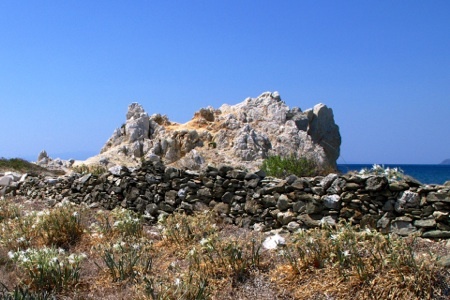 Phrygana is common on Greek Islands, particularly on rocky ground near to the sea, where it exists as climax state; it also occurs as a recovery phase following degradation by fire or in abandoned fields. 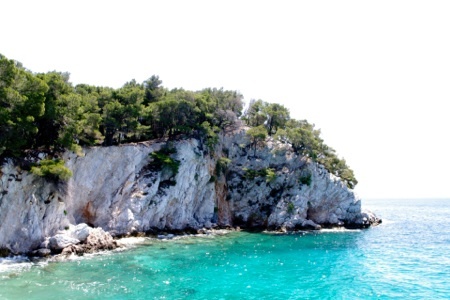 It is less prevalent on Skopelos than many other islands but there are some small but important examples of this type of habitat. The plants growing in these hot, dry environs show many adaptations to reduce water loss. The leaves are often small and thickened or needle like or have a hairs or wax, giving a grey or bluish appearance. 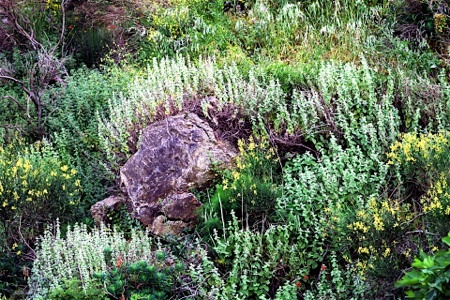 During the summer months phrygana appears as a collection of dry, lifeless, spiny plants but in springtime is bright green and sprinkled with flowers of many colours. Phrygana may be dominated by a single species or exist as a complex mix of many different plants including aromatic plants valued for culinary or medicinal properties. 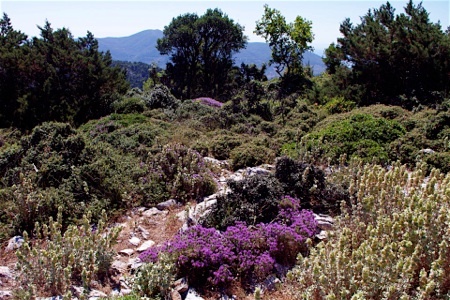 Phryganis (φριγανης) is a term first coined by Theophrastus to describe small woody plants or undershrubs, but is now used in a different way, to describe a habitat. 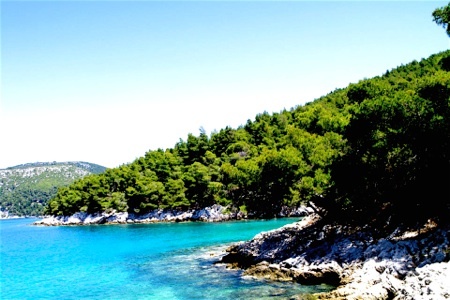 The sea modifies climate extremes and the complex, indented coastline, where jagged cliffs alternate with rocky coves, sandy shores and pebbly beaches, add a further dimension to the complex mix of plant communities on Skopelos. 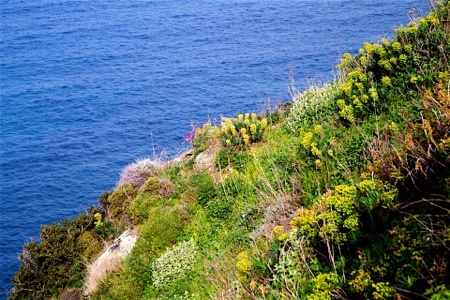 In some places the coast is geologically unstable with the land sliding into the sea in response to the turbulent winter waves; here the inland vegetation often continues to the edge of the sea. 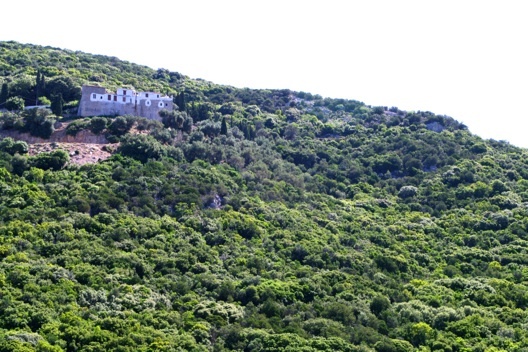 Aleppo pines border the cliff tops on long stretches of coastline, the olive groves reach the edge of the sea. 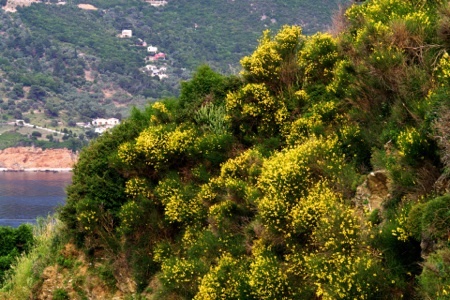 Northern European coasts including Sea bindweed (Calystegia soldanella), rock samphire, known in Skopelos as kritama which is widespread on cliffs and rocks. others such as the sea daffodil, (Pancratium maritimum), and hairy catchfly, (Silene sedoides), are Mediterranean specialists. 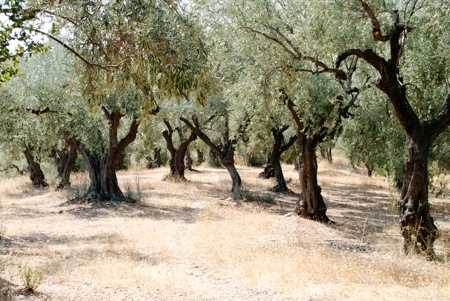 Since ancient times, olive groves have been a distinctive feature of the Mediterranean landscape, it is the only tree which grows exclusively in the Mediterranean climate region and had been used to define it. 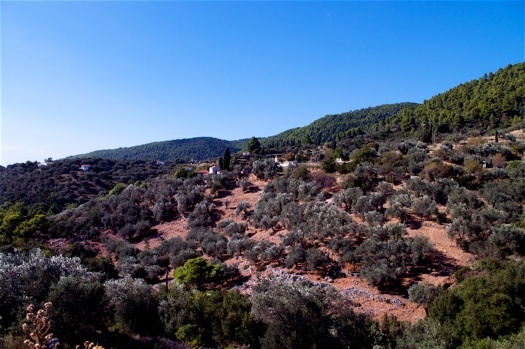 Although not strictly natural, it has been recognised that olive groves and orchards create environmentally sustainable habitats, which can support a rich and varied flora. 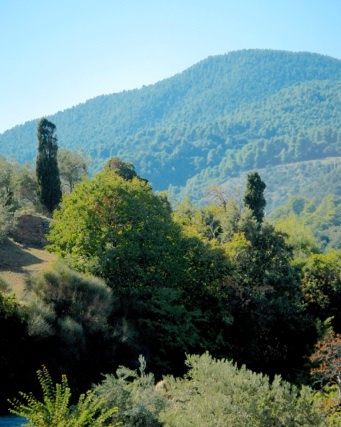 On Skopelos, orchards and olive groves are concentrated in the Staphylos valley and they also create a patchwork of habitats bordering the forest across the islan. 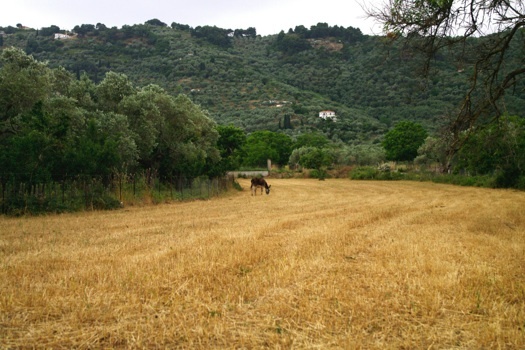 In the Glossa area many are mixed orchards, with olives, almonds and fruits grown together. 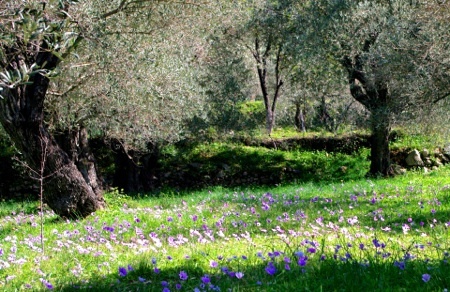 Depending on how they are managed, the olive groves may harbour nothing but thistles and squill but may contain anemones in spring and other beautiful wild flowers. It is in the olive groves and orchards, that orchids can be found including members of the intriguing genus, Ophrys, each named after the insects they resemble. and at the same time the most threatened. "3 WWF. Although not aesthetically valuable from the human perspective, wetlands provide important refuges not only for moisture loving plants but also for insects, amphibians and birds. 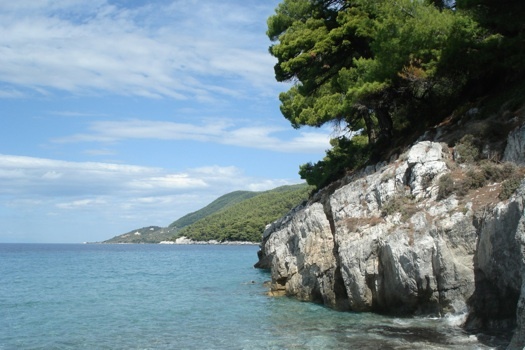 There are no large wetlands on Skopelos, but small areas do exist. 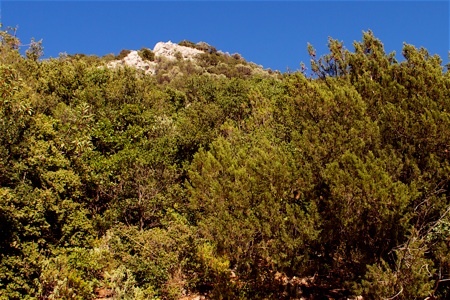 Loutsa is wet in winter but dries out in summer when it supports phrygana-type of vegetation (see above). 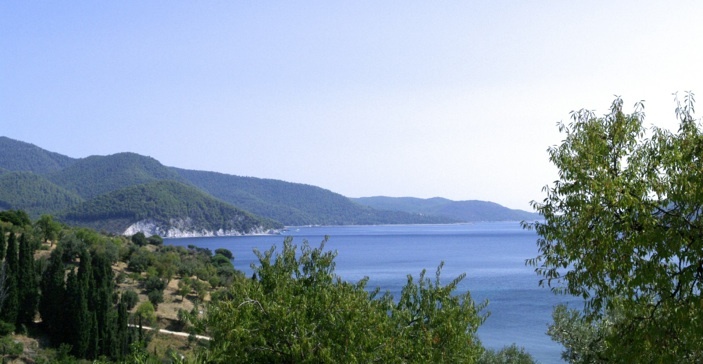 The area above Milia beach becomes flooded by winter rain and stormy seas, retains brackish water throughout the summer. 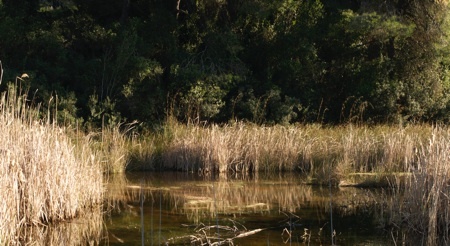 The inland marshland at Loutsa and at Milia have been recognised by Presidential decree for their environmental value4. allowing broad-leaved deciduous trees to exist. In these valleys, oriental plane, sweet chestnut and walnut, to thrive and in the cool shade of these trees, herbaceous plants ore typical of a milder climate persist into the summer months. 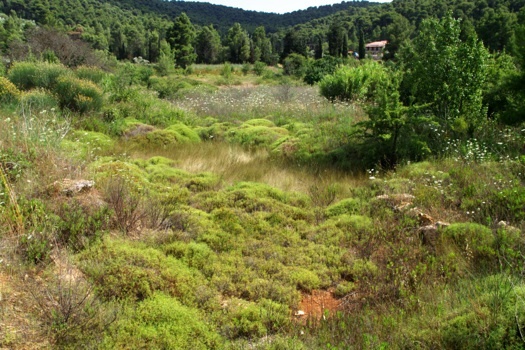 The Karya valley and Potami (meaning river) are important areas of this type of vegetation. 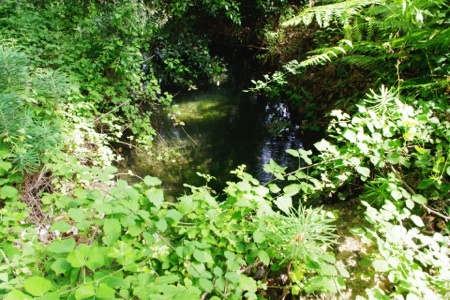 Under the shade of plane trees, there are often freshwater springs, which support animals as well as plants. 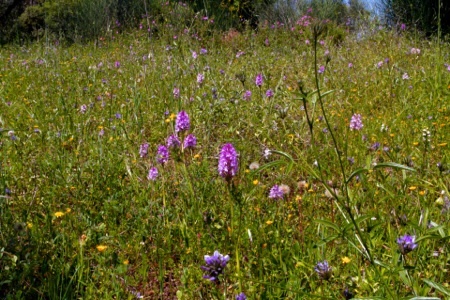 There are no extensive expanses of grassland on Skopelos, although there are some well managed meadows but dry grassland is interwoven into many of the habitats described above. In summer months there are many areas of parched bare soil but with the autumn rain, they become green and rich and in spring are scattered with wild flowers in a variety of colours. 1. Polunin and Huxley. Flowers of the Mediterranean.Chatto & Windus. 1981. London. 2. Grove and Rackham. 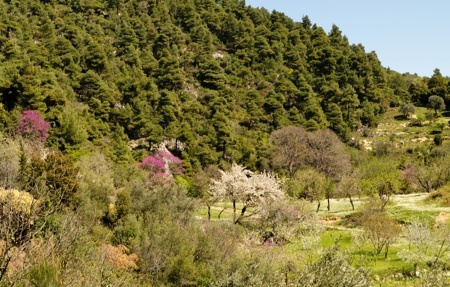 The Nature of the Mediterranean Landscape. Yale University Press. 2001. 3.WWF. Island Wetlands. 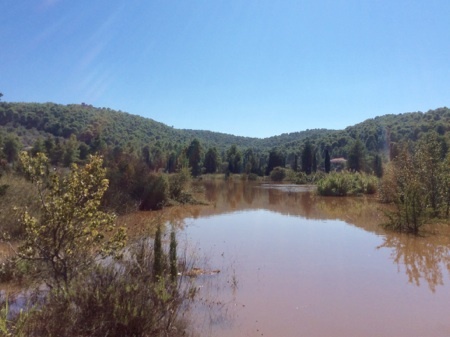 An outline of the Conservation of Greece’s island wetlands initiative. 4. Οι υγρότοποι του Αιγαίου.WWF.Ελλας. 2006. 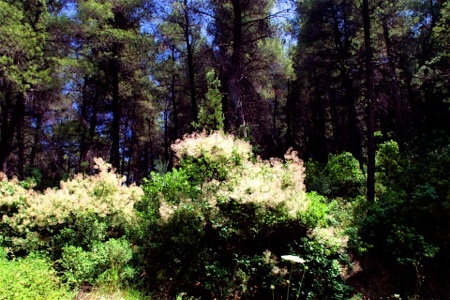 The Island of Skopelos has, for its size, a surprising variety of plant communities, which create a complex mosaic of habitats supporting a rich, diverse array of flowering plants, which vary from huge plane trees to minute geraniums, from brilliantly coloured poppies to dull weeds and from common daisies to exotic terrestrial orchids and precious Greek endemics.